(June 1, by Paulus Kieviet) On May 29, I went through the Nukuoro translation of Malachi 4: the last chapter to be consultant-checked. 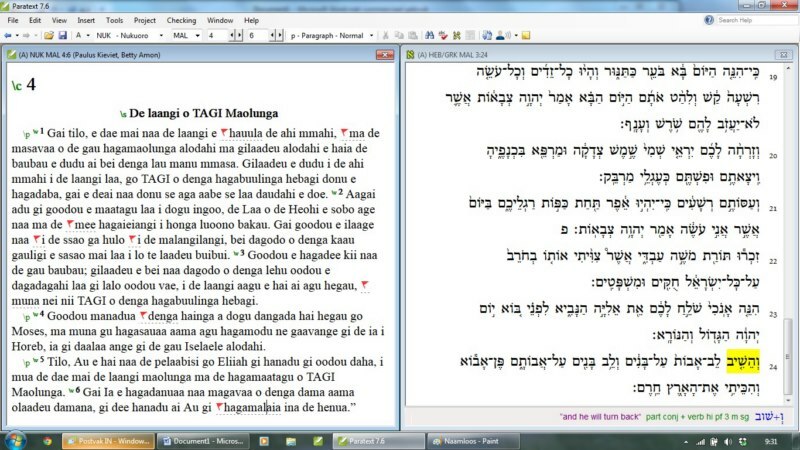 This means that the consultant check of the Nukuoro Bible is now completed. This is an important milestone in the Nukuoro translation project. Together with translator Betty Amon, I started this check in March 2011, when we checked Genesis on Guam; after that, most of the check was done by distance. (We only met twice more: once during a conference, and during my visit to Pohnpei last year.) We alternated New Testament and Old Testament books, depending on what Betty and the team had prepared. We kept in touch by telephone, but mostly indirectly, by adding our notes and corrections to the translation and responding to each other’s comments. Now, after more than four years, this part of the project is finished. Does this mean that the translation is done? No, but we are getting close. Betty is now going through my comments, both on her own and with the team. This is a huge job: dealing with over 10,000 notes and questions, considering every single one, adjusting the translation where needed, but leaving the text alone when it is just right. After that, I will look at her replies to my notes, and see how the translation has been adjusted. There will be further checks; with a project this size, it is not easy to stay consistent throughout. For example, when a Biblical term has been changed in one place, it may have to be adjusted in other places. And when a text has been adjusted in Matthew, the corresponding text in Mark (which may or may not be identical in Greek) should be checked again. Even so, we are getting closer to finishing this project. 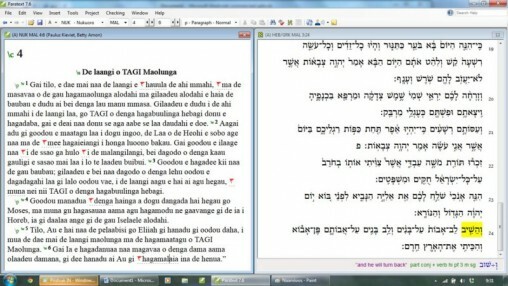 Malachi 4 in Nukuoro and Hebrew. The red flags represent my comments.